We can gleefully debut our special Christmas/Holiday edition with some happy, and certainly unexpected, news: Congress suddenly grew a brain and is funding NASA’s 2016 budget back to historic levels. 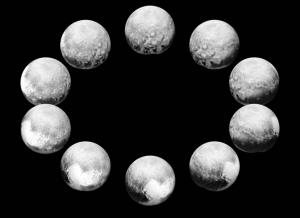 The proposed 2016 budget increase for NASA will help the space agency move ahead with planetary missions such as its New Horizons spacecraft that took the above extraordinary full revolution portrait of Pluto earlier this year. After the devastating cuts this past decade that slashed the agency’s budget 25 percent, and on the heels of the current Congressional witch-hunts led by Congressman Lamar “Joe McCarthy” Smith (R-Texas) targeting many Earth scientists serving both NOAA and NASA for publicizing their scientific data on global warming, the Galactic Sandbox staff is pleased to report that Congress is on the verge of passing a $19.3 billion NASA budget for 2016, $1.3 billion more over the 2015 figure. NASA satellite image shows Alaska’s Columbia Glacier receding in before and after photos from 1986 and 2014 (right0. Of course there is a caveat: Earth sciences (which includes the study of how we will eventually burn up in a hellish carbon monoxide blanket of our own making) got funded less than requested, but at least the division will receive more than has been doled out in the past… a $149 million increase over last year for a total of $1.92 billion. Considering the latest subpoenas Rep. Lamar “dumb-as-doorknobs” Smith slapped on NOAA for private emails, it’s a small miracle the earth sciences field got anything at all. 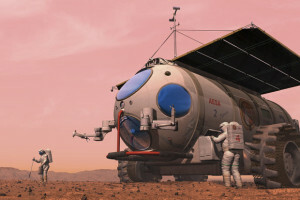 Because of the prior cuts –and Republican grandstanding for their red meat base — NASA officials had, among other things, resigned themselves to having to suspend all future planetary-science missions much like the New Horizons to Pluto or the Rosetta mission surveying the Ceres asteroid – until 2020.. As for future excursions to Mars, NASA has been relying on the private sector and the occasional bake sale just to advertise their brownie button contests to whoever gets there first. Significantly, the newly-proposed budget will allow the U.S. space agency to plan for a robotic mission to Europa and will bolster the commercial-crew development NASA has set its heart on, in addition to a new American Space Launch System subcontracted between Boeing and Space X, to place manned crews beyond the Moon to reach the gas giants and the outer solar system without the Rube Goldberg gravity sling-shot assists from Earth or Venus. The Christian Science Monitor put out a good story this week on how the new 2016 budget has rejuvenated NASA engineers’ endeavors to get to Europa, one of Jupiter’s many (and largest) moons, and the one that scientists have pinned their hopes on for finding extraterrestrial life in our solar system. Many scientists believe that beneath the cracked and frozen ice of Europa lays a vast sea, perhaps teeming with biology. Interestingly, despite Arthur C. Clark’s “fictional” warning in “2010: Odyssey Two” in which Europa sends a message to Earth, “All these worlds are yours except Europa. Attempt no landing here,” Congress actually “ordered” NASA to land something there, with hardware specifics – as if Congressional politicians know what is needed for a space mission. What presumptuous morons. 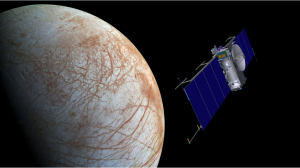 NASA has yet to announce any specifics for the future Europa jaunt. However, the space agency’s current timeline for launching a craft to the Jovian moon is 2022, with a landing on its icy surface three years later. 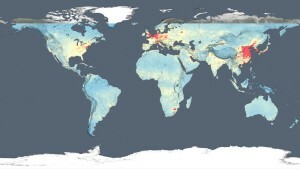 I’m surprised that this next news item did not get censored by Rep. Lamar Smith’s House Committee on Science, Space and Technology: Last week NASA released the graphics of air pollution around the world, as compiled by their Earth monitoring satellites, from 2005 to 2014. It shows that the United States has slowed its carbon emissions in the last nine years – with the glaring exception of a swath coming from the Los Angeles Basin in California which I’ll address further down – but as for China, specifically Beijing, they’re screwed. However, before you breath a sigh of relief, this doesn’t mean the world is better off, because other areas, like China’s metropolitan centers, are still pouring out too much…even though they have reduced their emissions by 40 percent! Collectively, because of human over-breeding on the Earth, we are still putting a blanket over the planet during a heat wave. In other words, yes, Senator Cruz, we are causing global warming. 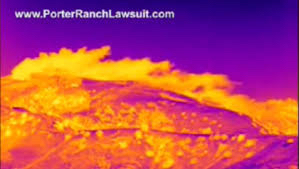 False color time-lapse video shows toxic and flammable methane spewing from a gas well blowout near Porter Ranch Ca. SoCalGas doesn’t expect it will be able to cap the ruptured well for another four months. In what is now being seen as the largest environmental catastrophe since the BP oil spill, a certain brand new smog cloud of highly-flammable methane gas has formed in the L.A. area, in an outlying community called Porter Ranch. Southern California Gas Co. officials this past week finally fessed up to the reality of the massive natural gas leak that started two months ago after 1,600 families were evacuated from their homes and two schools were closed down indefinitely. 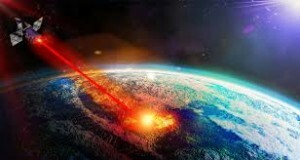 Now NASA has shoved themselves into the quagmire, after the Federal Aviation Administration declared a no-fly zone over the area since any spark from an airplane engine could ignite the methane, creating the mother of all roman candles. Needless to say, NASA had to get special permission from the FAA to fly data-gathering planes through the immense cloud of poisonous gas in order to figure out how bad the environmental calamity is. SoCalGas says it will take them four months to cap the noxious leak. Thank you, energy pimp masters! How are your kids’ teeth doing after I paid for their orthodonistry these last ten years? Elon Musk of the private space launch company Space X has announced that they will launch a new and improved Falcon 9 rocket this month. The company is striving to fulfill the role the space shuttle did for so many decades and are in the running against Boeing. 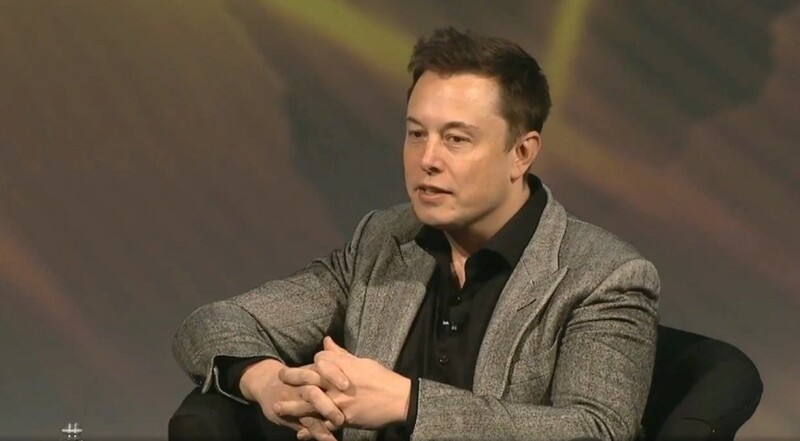 Space X CEO Elon Musk. Commenting on the failed Falcon 9 rocket launch last June, Musk says the rocket’s first stage is “significantly improved,” but questions from critics remain unanswered. In June, Space X’s cargo shuttle to the International Space Station went kablooey when a strut holding down a helium bottle within a propellant tank busted, causing the tank to over-pressurize and burst. 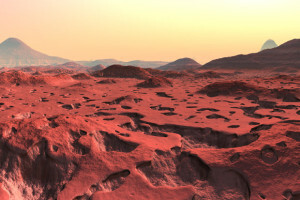 Martianauts wanted to explore the Red Planet. Get this! 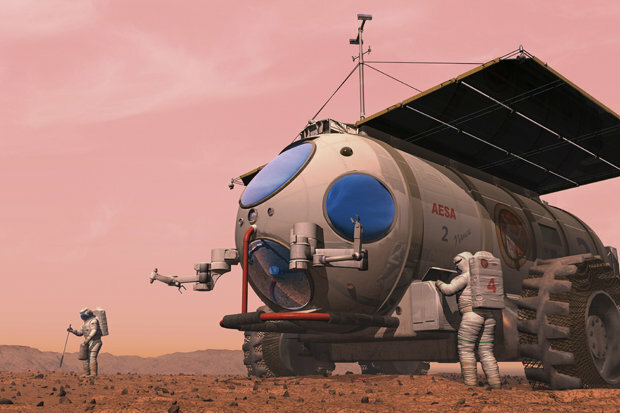 NASA is accepting applications from now until mid-February for would-be astronauts to go to the Red Planet. Hmmmm. Mind you, it’s gonna be a while before Lamar Smith, er, that is, NASA is going to send actual human beings to Mars. But apparently, if you want to get in on the ground floor of it all, and think you have right stuff, apply now! If you get the job now you are slated to travel on the International Space Station and the Orion deep-space exploration vehicle soon – all precursors to the Mars missions. And once again, Space X CEO Elon Musk added his two cents to the ad. He warns space enthusiasts that the clock is ticking for a Mars trip before it is “thwarted by World War III.” “You back up your hard drive. Maybe we should back up life too,” said Musk. I think he has something there. Russia reportedly wants space-based weapons a things of the past. Trump and the journalist-murdering dictator Vlad Putin. Nonetheless, Vice News reports the Russians have proposed this. I presume the Russkies know full well that is easier said than done. For obvious verification reasons, undoing Earth-orbiting weapons in space is ten times harder than neutralizing nuclear arsenals on land. 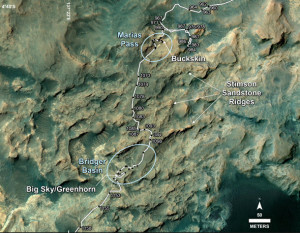 Curiosity’s route on Mars’ Mt. Sharp where it found the rare Tridymite. theories that Mars was covered by lots of lakes and seas billions of years ago. Blue Tridymite dust kicked up by Curiosity rover drilling. Tridymite on Earth is super rare – apparently even more rare than Benitoite which is only found in any collectible amounts on San Benito Mountain in California. Tridymite, like benitoite, is found only in the most peculiar of conditions, which includes high-pressurized temperatures in igneous or metamorphic rocks, and is found in volcanic deposits with high silica content. 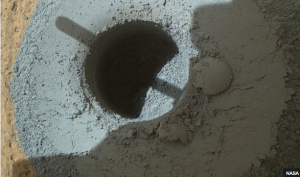 Curiosity’s latest find points to remnants of lakebed deposits. And that’s another indication of past water, and present water, NASA says. 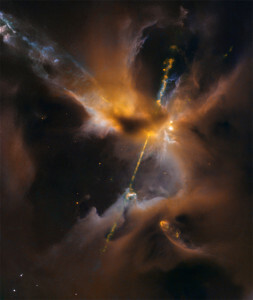 The Force is strong with this one.. Photo of impressive gas-belching star was recently snapped by Hubble Telescope. And to wish you all a wonderful New Year, I end with a stupendous photo just snapped this week by the still ticking Hubble Space Telescope. The photo shows super-heated jets shooting out of a new star in the Orion B Molecular Cloud Complex (that’s what they officially named it…. believe me, I DID NOT). And naturally, never to miss a crowd-pleasing angle in their outreach, NASA ‘s press release on this snapshot was overflowing with Star Wars references and endless hideous puns about light sabers. Hey, whatever gets people to care about space exploration is all right with me.